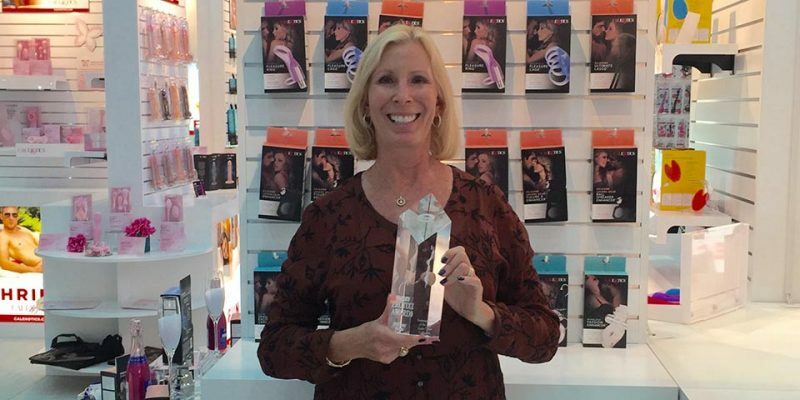 CalExotics was presented with the Best Sexual Wellness Product Line Award for Inspire, and the company’s Founder and CEO, Susan Colvin, was presented with the Business Woman of the Year award during the 2016 eroFame show. This is the sixth consecutive year CalExotics Founder and CEO has received the Business Woman of the year award. “It is a privilege to be recognized and truly humbling to receive this award for the sixth time. Thank you to everyone who has helped me throughout my career, I wouldn’t be here without all of you,” says Susan Colvin, Founder, and CEO of CalExotics. Colvin has been in the industry over 30 years and was the first women to own a novelty company. Her determination, savvy business skills, and positive attitude have secured her place as the top business woman in this field. Inspire is a line of sexual health and wellness products designed at improving the lives of women, while also supporting the nonprofit organization Living Beyond Breast Cancer (LBBC). LBBC provides programs and services to people whose lives have been impacted by breast cancer and has been in partnership with CalExotics for over ten years. “Inspire truly is the best sexual wellness line. Its products were created with sexual health in mind, and 5% of the net proceeds help benefit this amazing cause. Thank you to everyone for your support,” says Jackie White, Executive Vice President of CalExotics. The Erotix Awards recognize individuals and companies for their outstanding work and achievements in the adult Industry and are announced and presented during eroFame. Winners received the awards at their stands,a full list of winners can be found here.